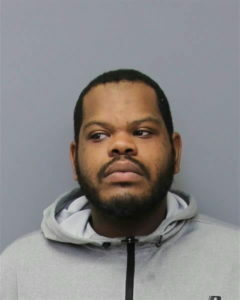 On January 19, 2019, at approximately 2:20 pm, Deputy Thayer from the Charles County Sheriff Office responded to the Safeway on Market Place in Waldorf for the report of a shoplifter in custody. Upon arrival, the officer made contact with the witness who stated that the subject attempted to flee the scene and is actively fighting with a loss prevention officer. The deputy ran inside and located the victim and a male, later identified as Mondre Antonia Burroughs, 29 of Welcome. The victim was attempting to place Burroughs in handcuffs. The deputy made contact and identified himself as a police officer, and Burroughs placed his hands behind his back and was placed in handcuffs. Burroughs continued to yell as the officer attempted to calm Burroughs down. Burroughs was taken to the loss prevention office so that the officer could investigate the incident. While in the loss prevention office, Burroughs provided a false name and birthdate to the officer. While the deputy was attempting to verify the information, Burroughs put his head down and told the deputy that he has a warrant. Burroughs was quickly identified through a local check done by communications and confirmed by the District Station. The officer spoke to the victim and was told that he observed Burroughs take multiple food items from the freezer box and place them into his book bag. The victim stated that Burroughs then walked past all points of sale towards the exit where he was stopped for theft. The victim also stated that Burroughs walked back to the loss prevention office without incident. Burroughs then pushed the victim out of the doorway and ran through the flower department. The victim stated that he caught up to Burroughs and attempted to stop him. The victim then told police that they both fell to the ground and Burroughs got on top of him, broke his eyeglasses, and attempted to gouge out his eye. The victim also stated that the only thing that stopped the assault was the manager that was able to get one of Burroughs’ hands in handcuffs. The total amount of items stolen from Safeway was $130.06 and the eyeglasses damaged were estimated at $100. Burroughs was arrested and charged with disorderly conduct, theft $100 to under $1,500, malicious destruction of property value $1,000, fraud person ident avoid prosecution, false statement to officer, assault-second degree, and assault-first degree. Burroughs was released on his own recognizance on January 22, 2019, and is due in district court on February 12, 2019. This entry was posted on February 1, 2019 at 1:25 pm and is filed under All News, Charles News, County, Law Enforcement, More News, z 600X120 Top Ad Bottom, z Police Ad Top. You can follow any responses to this entry through the RSS 2.0 feed. AGAIN,just let him walk.Judges are doing a great job releasing a violent criminal. Another transplant for D.C. or P.G. County. released on his own recognizance, WTF Commissioners. The Dorf is where “they” all live anyway. Should just call it a prison and go with it. The eyes! LOL! What’s going on stage left? Yea, and where’s the profile shot? Why is he a “welcome” man? Why would they greet warmly a thief? “welcome wagon”? Food. I don’t understand making a bum like that feel at home!!!!!!!!!!!!! MUST BE Democrats. Joe, you are very stupid. Please don’t reproduce. But he is your real father…..too late! Didn’t your mom tell you? Wasn’t this crim the thief-turned-servant, to “The Count of Monte Cristo”? He must’ve run out of treasure and reverted back to his old ways.